Close games are often decided by which teams can make the most free-throws down the stretch. To put it simply, free-throws are the most important shot in basketball. Every basketball coach knows that. But even with this knowledge, most coaches still don’t spend enough time with their team practicing their free-throw shooting. And when they do, they often don’t practice them in the most effective way. I’m going to show you 5 drills you can use with your team to make them much better free-throw shooters. I’m going to start by explaining the WRONG way to practice free-throw shooting. The wrong way to practice free-throw shooting is telling your players to just “Shoot/make 5 free throws” between drills. And unfortunately, this method is the most common among beginner coaches. The reason this is a poor method is because the players won’t be under pressure like they are when playing a game. 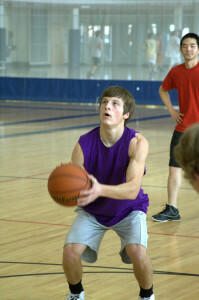 They will just walk to the free-throw line and shoot without putting much effort or concentration into it. This is not what we want the players to do. The players are in a completely different mindset when they’re under pressure. We need to put them in that pressure mindset during these free throw drills to simulate the pressure of a real game. The drills I’m about to share with you will accomplish this. It will force your players to concentrate. Make sure the players are fatigued before they step to the line. This makes it realistic. They’re barely ever going to shoot an un-fatigued free throw in a game, so why should they in practice? Do them after a hard conditioning drill. Here are the 5 drills you can use that will make your players better in-game free throw shooters. They are broken up into two categories… team drills and individual drills. The ‘Individual Drills’ are drills that take longer to complete and are performed by only one player. These drills should be used when the player in training by themselves or in individual workouts. ‘Team Drills’ are the drills that I recommend you use in your practice. Both individual drills I’m about to share with you can be customised to the skill level of the player you’re coaching. Keep in mind when you’re reading the following drills that you can change how many points they get for a made basket and how many points they lose for a miss. For instance, most of my players play ‘Plus 1, Minus 2’. This means that they start on 2 and must try to get to 10. If they’re on 7 and make a free throw they go to 8, but if they missed on 7, they would be on 5. 1. Swish – Break your players up into two’s on three’s at each basket. The way the drill works is the player shooting starts on 5 and the goal is to get to 10. The rules are: For every swish, the player gets 1 point. For every made basket that is not a swish, they get 0 points. And for every miss, they get -1 points. 2. Plus/Minus – Plus/Minus is similar to the ‘Swish’ free throw drill except you don’t need to swish the shot. To keep it simple, let’s say you start on 5 points and your goal is to get to 10. The rules being, if you make a shot you get 1 point, if you miss a shot you lose a point. 3. Laps – This drill is best performed with 3 players at each basket. If you don’t have enough rings for that, then it will work fine with more. The only downside to that is the players won’t be as fatigued when they’re shooting their free-throws. The drill is simple. 5 minutes on the clock (or how ever many minutes you want). The first player shoots two free-throws. If he makes both, he doesn’t run. If he misses one, he does an up-and-back sprint. And if he misses two, he runs a full lap all they way around the court. 4. In-A-Row – Split your players up into groups of about 3 at each basket. The goal of the drill is to make a certain number of shots in a row before the time expires. You can decide the amount of shots they need to make in a row depending on the age and skill level. For his example we’ll say they need to make 5 in a row. The first shooter steps up we’ll say they make 3 and then miss the 4th. You can decide they can either just join the end of the group, or there could be a consequence for not getting 6 in a row. They might have to perform an up and back each time they miss. 5. Baseline Free-Throws – The whole team starts on the baseline. The drill involves every person on the team going to the free-throw line one-by-one and making a free-throw. But the kicker is that every time a player misses a free-throw, the ENTIRE team must perform an up-and-back. There are different ways you can change the drill up depending on the age and skill level of your team. For a youth team, I would only ask that they make one free-throw. But for my older teams, they must make two in a row. So if they hit the first and miss the second, the team still runs and then they try again. Are there any other free throw drills that you use with your team? I’d love to hear about them since I like to change up the drills and bring in new ones often. Share this article with other coaches you know. I’d really appreciate it!